The Indian government has long tried to act as a bridge between different worlds. A co-founder of the Non-Aligned Movement during the Cold War, India declined to take sides between the United States and the Soviet Union in their decades-long confrontation. In recent years, India has cast itself as a leader of the emerging market economies — such as China and Brazil — with unique national interests that lay neither wholly with developing countries nor with Europe, Japan and the United States. But Indians, especially those who live in urban areas, are far from neutral in their views. They feel closer to the United States than to China. And they are worried about Iran acquiring nuclear weapons. A majority of Indians living in cities have a favorable view of the United States (58%), a positive opinion of Americans (57%) and confidence in President Barack Obama (60%). Such confidence in Obama is one likely reason a majority of city-dwelling Indians (57%) back his international policies, approve his handling of global economic problems and say relations with the U.S. have improved in recent years. A majority of urban Indians (56%) would also like to see President Obama re-elected. Among those who say they are closely following the election, a 71%-majority wants Obama to have four more years. The American president’s support in Indian cities is roughly comparable among men and women and people of all ages. His backing is slightly stronger among urbanites with a college education or a higher income. Among the foreign leaders asked about in the survey, Obama is clearly the most admired. Far fewer have confidence in Russian President Vladimir Putin (35%), Chinese leader Hu Jintao (22%) and German Chancellor Angela Merkel (20%). The low ratings of Merkel and Hu, at least, are likely tied to the fact that about half are unfamiliar with either leader. Indians in cities are also generally supportive of the exercise of U.S. power, both hard and soft. They broadly favor (73%) American-led efforts to fight terrorism and a plurality (48%) backs U.S. drone strikes targeting extremists in countries such as Pakistan, Yemen and Somalia. Most (69%) also admire U.S. scientific and technological advances, with college-educated, urban Indians being particular fans. 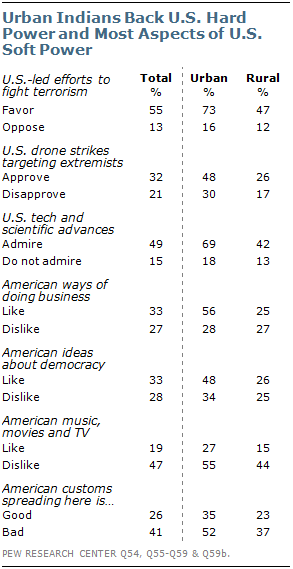 A majority (56%) likes American ways of doing business. And a plurality of Indians in urban areas (48%) admire U.S. ideas about democracy. Nevertheless, roughly half (52%) think it is bad that American ideas and customs are spreading in India and a 55%-majority of Indian city dwellers dislike American music, movies and TV. Support for all things American is lower in rural India, in part because of the large percentage of the population that voices no opinion. Facing a growing commercial rivalry, border tensions and concern about China’s intentions in the Indian Ocean, urban Indians tend to take a dim view of their relationship with their fellow emerging market and northern neighbor, China. By a 44%-to-33% margin, more say they have an unfavorable view of China; 23% venture no opinion. And while 40% see Delhi’s relationship with Beijing as one of hostility, only 28% see the relationship as one of cooperation and 21% don’t know. About half (53%) of Indians living in cities think China’s growing economy is a bad thing for India, and only 26% think it is a good thing. Nearly six-in-ten urban Indians (58%) who think Chinese commercial success is a bad thing for India also characterize the bilateral relationship as a hostile one. Indians also take a more skeptical view of China’s role in the international arena. Only 20% of urban residents think China is the world’s leading economic power. By comparison, across the other 20 nations surveyed by the Pew Research Center this year, a median of 42% see China as the global economic hegemon. India has long-standing cultural and economic ties with Iran, to the west of Pakistan. At least 10% of India’s roughly 160 million Muslim citizens are Shia, the predominant Muslim sect in Iran.8 Nevertheless, only 28% of urban Indians have a favorable view of Iran, and about half (52%) of city dwellers oppose Iran acquiring nuclear weapons. Of those urban Indians who oppose Tehran’s nuclear ambitions, about six-in-ten (62%) approve of tougher economic sanctions to try to curb Iran’s efforts to become a nuclear weapons state. And nearly seven-in-ten (69%) urbanites who oppose Iran acquiring a nuclear arsenal say it is more important to prevent this possibility than to avoid a military conflict. 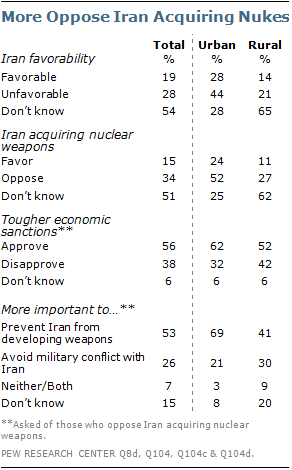 Nationwide, among those who oppose Iran acquiring nuclear weapons, 56% approve of tougher sanctions and 53% say it is more important to prevent Iran from developing nuclear weapons than to avoid a military conflict with the Iranian regime. India is not just looking at the world, the world is looking at India. Among the Asian nations where the question was asked, favorable opinion of India is highest in Japan (70%). This is the most positive Japanese assessment since the Pew Research Center began asking the question in 2006 and is up 11 percentage points since 2011. In contrast, only 23% of Chinese see India in a favorable light, down 10 points since 2006. And only 22% of Pakistanis are favorably disposed toward India. Pakistani appraisal of India is up eight percentage points since 2011, but down 11 points since 2006.